There is hardly another topic that fascinates architects more than new materials, with their previously unimagined properties and enchanting haptic surfaces. Yet if you look at built reality, these hardly play a role. On the contrary, the international trend continues to move towards natural surfaces made of wood, brick and natural stone. As aesthetically and ecologically meaningful as they may be, this development becomes alarming when buildings and interiors in southern China, Paris or Copenhagen become indistinguishable. 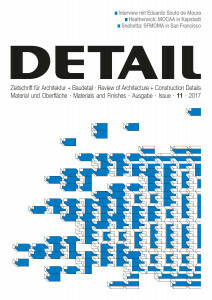 The examples in this issue show, however, that individual solutions are still possible even within a narrow range of materials and colours. Just a few years ago, natural stone and solid wood – building materials used today by the luxury sector – were cheaper than concrete and veneer in countries like Portugal, as the Pritzker Prize winner Eduardo Souto de Moura explains to us in an interview. In his eyes, the design elements of architecture remain the same throughout history, only the materials change. Renzo Piano takes the opposite tack with his parliament building in Valletta. Using the local coralline limestone of the historic city’s fortifications as a starting point, he interprets the erosion forms of the rock in an innovative, high-tech natural stone facade. As a counterpoint to the examples using ­traditional materials, our Technology section examines the production and assembly of the polymer facade at the Museum of Modern Art in San Francisco. This is the largest building envelope to date made using fibreglass reinforced polymer (FRP) cladding, a material that was developed decades ago. This project shows how long it takes, especially in the building industry, for new materials to be used on a large scale – and their potential for the development of the built environment.